This means, that I won’t be able to get much knitting done and not nearly as much blogging…unless I have a procrastination attack…in which case I’ll probably be knitting and blogging like a mad thing. Gahh. 3. You must have a blog (that is updated regularly, as I will blog stalk you to find the right gift for you). Include your blog address in your comment. A Ravelry handle could also be very helpful, so add that too, please. 4. After commenting here, you must repost this or something similar to your blog in 48 hours. If not, I will choose the next person who comments…Its that simple!! Looking forward to playing this game with you. It’s like one of those annoying chain letters from your childhood, only it’s not a complete waste of time. You get stuff! Handmade knitted stuff. 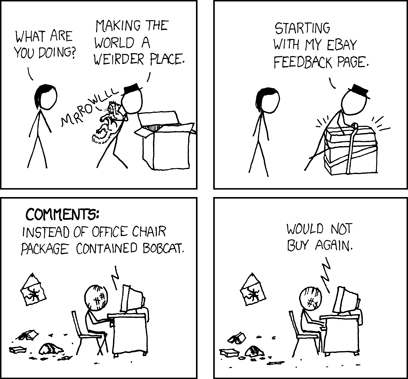 One of my favorite XKCD comics, mildly relevant to this contest. Enjoy. By the way, SO not sending you a bobcat, knitted or otherwise. Unless that’s what you really want, in which case I’ll try to figure something out. There must be a bobcat dishcloth pattern out there somewhere. Next What will the alien archaeologists make of my knitting bag in 10,000 years? Yup! I made that mistake once and I relaly learned the hard way. My whole extended family were traumatised (as it happened at a big family occasion). Still, like you, I’ll relaly never make that mistake again so perhaps it was a lesson well learned. Good luck! I love this idea! I just posted a couple of minutes ago, so I’ll add this to my WIP Wed. post. Thanks so, so much! My rav handle is gnomesbeatfaeries. That has to be one of the more unique Ravelry handles I’ve come across. Lolz- thanks, I think. Definitely one of the downsides to signing up for ravelry as a teenager. I have always enevid those who are great at knitting. That Entrelac design is just amazing! Although I can knit, I never really liked to do it. I do love to crochet though! Maybe some day I will try knitting again and maybe just maybe I will like to do it now! Robin, Her knitting was so bufatieul. I really loved the Entrelac too. She made it seem so easy and I might try it again, but it will have to be put in line with the other crafty stuff I’m doing! If you try knitting again, be sure and post.Thanks for dropping by. I look forward to blog stalking you and coming up with something clever to send you. I’ll contact you for contact info when I’ve got something ready. I’ll probably post about it too, knowing me. I’ve known Chris for a very long time and she is a very talented knettir/crocheter and designer (even though she’ll dispute the designer label)! Thanks for a writing this story although I can’t get to it on the website right now and I don’t get a subscription to this paper at this time. There’s always so much going on at a meet-up that it’s easy to make mitaekss. I spent the whole time frogging my mistake (that I’d made BEFORE I went) and then knitting back up and one row past where I’d started. So much for completing the darn thing! However remember it’s the process that counts, right? Sure. Uh-huh.Hope 3rd time was lucky!